We can manufacture a wide range of Standard Color Masterbatches With an active color database of over 1000 shades for all major processing methods, compatible with Poly olefin's (PET & PP), PET, BT, HIPS & ABS. We can produce tailor made master batches as per the customer's requirements. We have various color shades suitable for different applications. Our Color Master batches have excellent dispersion, UV and weather resistant properties, high brightness and opacity, low LD with good heat resistant & light fastness. We also have suitable color masterbatches for food contact compliant with various National Regulations. Please write to us for suitable recommendations. Pink Masterbatch offered find application in meeting the coloring needs of plastics and can be used for polyolefin material under processes involving extrusion, injection as well as blowing.Further, its usage also allows processor to color raw polymers in an economical and cost effective way. We are the conspicuous manufacturer, trader and supplier of the finest quality Color Masterbatches. Well known for its remarkable properties, offered masterbatch is extensively used for making plastic products. Backed by the profound experience of this domain, we are instrumental engaged in supplying Blue Masterbatch that is available in various grades as per clients' demands. This product contains: Blue pigment, polyolefin and additives. It’s suitable for blow film, extrusion blow, injection molding, and some other product. With rich industry experience, we are offering the finest quality Orange Masterbatch. Suitable for blow molding and extrusion of various polymers, our offered range is highly acclaimed in the market. The basic material used in processing this product is procured from the certified vendors and guaranteed of its quality. After being processed, the entire range is stringently tested on defined parameters of quality. We have uniquely positioned ourselves as a dependable organization, engaged in manufacturing and supplying superb quality Red Masterbatch. 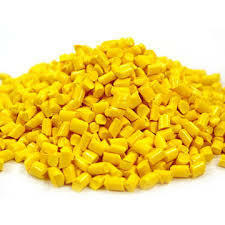 This product is widely used in various industries for blow molding and extrusion of various polymers. Clients can avail the entire range from us at industry leading prices. We are one of the leading firms of Green Masterbatches. This product is broadly well-liked by our clientele across the country. Our products are made by experts who employ the best grade input which is sourced from genuine suppliers of market. This product is broadly utilized in the market due to their features. Brown Masterbatch offered find suitability for injection and extrusion molding processes involving end products like PE, PP, Blowing Film and others.The offered products are processed using high grade basic material and the latest processing techniques in compliance with the set industrial standards. We are a prominent supplier in this industry, offering a premium quality Violet Masterbatch. These products are processed at our production unit under the supervision of our skilled professionals. Our offered product is available in different grades to meet the exact requirements of our clients.